Jetzt können wir euch den Titel des neue Transformers Comics von IDW nennen. Er lautet "The World in your Eyes". Dieses Comic wird ein 5 Teiler. A while since I typed this now, but still kind of amazing to remember this is happening! 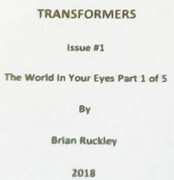 Issue 1 AND 2 of #Transformers out in March! Bei Amazon.com kann man jetzt das IDW Transformers Vol. 1 The World In Your Eyes (2019) TPB vorbestellen. In diesem TPB sind Heft 1 bis 12 und es soll im Oktober erscheinen. “A new era dawns with a new Transformers universe, as leaders Optimus Prime and Megatron vie to win the hearts and minds of utopian Cybertron. In the infinite universe, there exists no other planet like Cybertron. Home to the Transformers, and a thriving hub for inter-stellar commerce, it is a world brimming with organic and constructed diversity. Immense structures line its landscape. Mechanical giants roam across its surface. Starship-sized titans orbit its skies, keeping a constant protective watch above and below. Ancient Transformers merge into its very fabric. Small, mysterious creatures skulk in its shadows. It is a truly amazing realm, long untouched by war, and exuberantly reaching for the stars. This is the Cybertron that Optimus Prime and Megatron compete for in this bold new origin–a world of seemingly endless peace. All that changes when Bumblebee and Windblade take a newly-forged Cybertronian on his first voyage through this world of wonders, only to discover the first murder to occur on Cybertron in living memory! Soon, they’ll face the hard reality that the planet is on the brink of an unprecedented shift, and nothing will ever be the same”.